How does an 81 year old man walk briskly for an hour every day despite having been diagnosed with Parkinson’s Disease 24 years ago? How does a 38 year old woman with the same neurological disease compete on American Ninja Warrior, the popular television program that pits top athletes against each other on a giant obstacle course. The answer lies in the newly appreciated science of neuroplasticity. 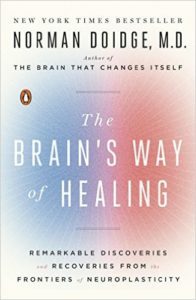 There are many fascinating stories in the book “The Brain’s Way of Healing”, by Norman Doidge MD., a NY Times best Seller. Neuroplasticity is simply the ability of the brain to make adaptations to trauma and disease by forming new neurons and utilizing different parts of the brain to compensate for lost ones. Just like an amputee has to use other muscles to compensate for a lost limb, the brain has the resilience to make similar adaptations. I use this every day in my practice to create more functional neuro patterns to compensate for herniated discs, torn knee cartilage etc. Our bodies are so wonderfully adaptable. With Parkinson’s patients I change both the restrictive tension patterns in the tissues and teach more effective organization in their thinking. I collaborated on a case study that was presented at the Brigham and Women’s Hospital last December. Here is the link. The 81 year old man is John Pepper. He has a whole chapter written about him in this book. Dr. Doidge travelled all the way from Toronto to South Africa to see for himself how Mr. Pepper has done the seeming impossible. It is accepted conventional wisdom that Parkinson’s Disease is a progressive, incurable neurological disease. It is characterized by stiffness, bent over posture, whisper soft voice, shuffling gait and tremors. Dr. Doidge saw none of these when he walked with Mr. Pepper. in fact he wrote that he had to work hard to keep up with the spry senior. Visits to his Primary Care Provider, neurologist, and family confirmed his story. He was diagnosed with Parkinson’s Disease by his neurologist in 1992. As recently as 2015 his neurologist confirms that he still has the disease. Yet he is able to have a very functional lifestyle. When I talked with him recently he told me that as long as he does his fast conscious walking he has no movement symptoms. On the occasion when he can’t walk for health or low back issues his symptoms return. John Ratey, MD author of “Spark, The Revolutionary Science of Exercise and the Brain“. in an interview on the podcast Inside Quest recommended Mr. Peppers story as an example of the effects of exercise on neuroplasticity. There is a growing body of evidence that there is indeed a link between certain types of exercise and how well a person can manage PD. Some of the types of exercise are tai chi, boxing, tango, and cycling. It is so amazing that a person who has difficulty walking can cycle normally for miles. Mr. Pepper is coming to the Boston area for several talks. Read the enclosed flier for details. He will share his story of how he has been successful at overcoming the main symptoms of PD. In addition to vigorous exercise he includes stress management, a positive mental attitude, a great deal of persistence, and moving very consciously. For example he has shown that you can prevent spilling a drink by changing which side of the container you place your hand. By changing your grip you have to use another part of your conscious brain that is less affected by the PD. 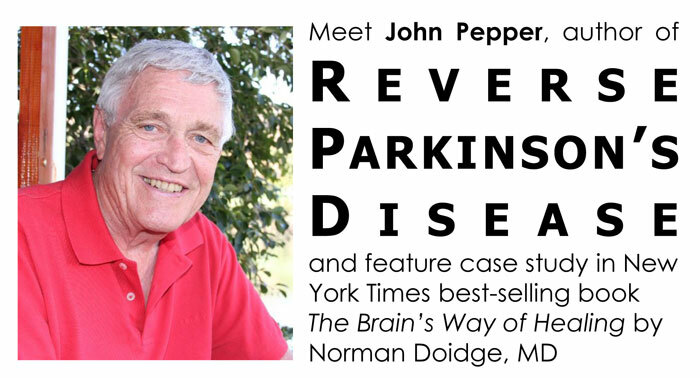 This is the why I think reading Mr. Peppers book, “Reverse Parkinson’s Disease” and listening to his story are so important. He is a great role model for how to overcome the depression and feeling of hopelessness that accompanying Parkinson’s Disease. He speaks very plainly and many PD patients tell me that his story resonates with their experience.